“Ten years ago, Peter Pan left Neverland to grow up, leaving behind his adolescent dreams of boyhood and resigning himself to life as Wendy Darling. Growing up, however, has only made him realize how inescapable his identity as a man is. Admittedly, I never read the original by J. M. Barrie as a child, but I’m fairly certain I would not have loved it nearly as much as I did this more mature and dark retelling of the beloved children’s classic. I am familiar with the story as I have watched more than one film adaptation of the original novel. 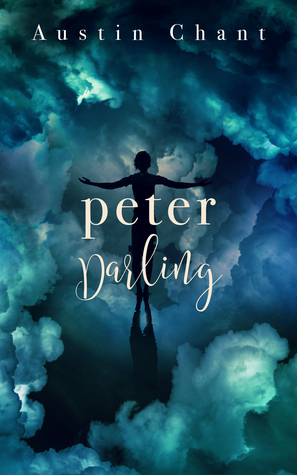 Although Peter Darling feels like a much more grown-up version of the original the novel captures the fantastical elements, sense of adventure, and magic of the original story. Upon Peter’s return to Neverland he finds that the world he loved and longed for while he was away has shifted and drastically changed. It comes across very clearly in the story that Peter’s return and eventual disappointment in the tone of peacefulness and contentment within Neverland was unexpected and jarring; having returned to the only place he felt he could live authentically and where he made the most sense to himself. The disorienting effects of seeing that the Lost Boys had moved on without him, gotten a new leader, and that the battles against Hook and his crew ended spur Peter into actions that have very real and devastating results. As a cisgendered unicorn I cannot attest to the authenticity of the representation in this novel; however, it is important to note that the trans and queer rep in this story are own voices. This leads into one of my absolute favorite aspects of the novel…and that is…the portrayal of Peter’s body. I have not read many novels with a transgender main protagonist, and even less with a male trans main character, but I so greatly appreciated the author’s decision (whether conscious or not) to not emphasize and include incredibly detailed descriptions of Peter’s body. While consuming media that has trans representation I often get a sense of trans bodies being fetishized and exploited. Oftentimes including a completely unnecessary obsession with what body parts, organs, and genitalia are present on a transgender individual’s body, as if the presence or lack thereof, has any bearing on the legitimacy of their gender identity. “He bit his lip, struggling to make words out of the war waging itself in his chest. “I don’t know what this makes me,” he managed at last. The novel very honestly delves into, and examines with great transparency, the dangers of misgendering of trans and genderqueer individuals. While Peter is in the “real world” he is constantly misgendered. He is frequently told what he can/cannot do, how he can/cannot present himself, what he can/cannot wear, and is constantly cornered into disgusting gender roles that are not conducive to his gender identity. It is very easy to make the leap into an understanding that the trauma he experienced bleeds into his life while in Neverland, especially after his return. It’s apparent through the desperation in which he tries to entice violence and revels in brutality. Peter’s character plays into stereotypically masculine gender roles and perpetuates toxic/hyper masculinity while in Neverland. Peter Darling is incredibly well written. Also, it is very easy to lose yourself in the atmosphere of Neverland. Granted, these things are very true about the novel, I did have some issues with the pacing, the progression of the story, and the development of the romance. I fairly easily forgave this…as the novel is barely over 200 pages and also includes an amazingly well done character arc for Peter. I would recommend this novel to fans of the original story, readers who love fairytale and classics retellings, readers who are looking for well-done transgender representaion, and those looking to read more own voice fiction. I give Peter Darling a rating of *7 Unicorn Horns*…Happy Reading! This has a very interesting premise.